The Trantec PT1 Personal Trainer is a UHF stereo Fitness audio system designed for use where cable free audio is a must. Gymnasiums and Fitness Centres would benefit from the high level of portability allowing the user to move freely around the fitness area without any loss of audio continuity. Also the cable-free aspect benefits installation, greatly enabling installation and maintainence to occur without hindering the daily operating routine of the establishment. Transmitter - The transmitter is DC powered, via mains adaptor, and features a menu driven LCD control panel which can display the levels of both audio channels together, or an average of both along with the operating frequency or user name. LEDs indicate stereo/mono and limiter operation. Receiver - The receiver incorporates a 360 degree beltclip, a membrane switch for channel selection, an LCD panel showing channel selection information, an on-off:volume control, 3.5mm stereo jack socket and LEDs showing power and RF reception. SPT1-CH: 10 way Trantec Recharging Station enabling 10 beltpack receivers to be fast charged. 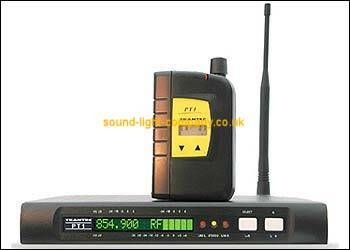 Goverment Regulations require a site licence for this equipment to operate at certain frequencies.